Recognition stickers are important for teachers as we all realize how precious and fragile a student’s feelings can be. Though some students may not finish first, great progress can be made when awarding for good effort or vast improvement. Use these stickers to tell your special student that you haven’t forgotten about how hard they are trying! In addition to recognition of effort, when a student does exactly what you have asked of them, you need to let them know. We have a fantastic range of merit stickers for teachers that feature basic sayings such as “very good” and modern sayings such “wicked” or “cool for those teachers that are too cool for school. We have cute characters that appeal to kids and awesome stickersheet materials that appeal to older students. 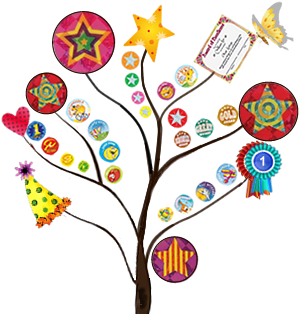 All in all, it’s time to let students know how well they’ve done by kitting out your teaching arsenal with merit stickers for teachers. Don’t let that special day go unnoticed, when a student has a birthday in class, let them celebrate with these Happy Birthday stickers. Also see Australian Teaching Aids for a range of themed stickers for teachers to use on special occasions such as Halloween and Christmas. Use these large 40mm You’re a star sticker to awards the winners of class competitions and projects. These stickers are colourful and make a lasting impact because of their size, they are truly hard to miss.